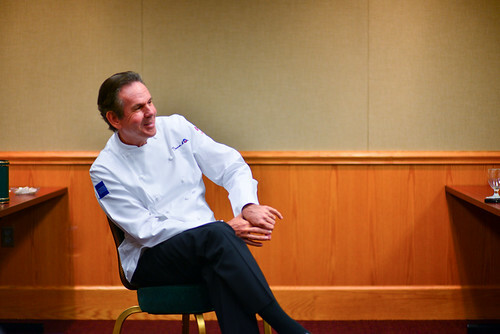 Having now spent nearly two weeks, collectively, at The Greenbrier photographing for the Bocuse d’Or USA Foundation, I have learned one thing: at The Greenbrier, anything is possible. On my first visit in July, the executive chef, Richard Rosendale (who will be the United States’ competitor in the upcoming Bocuse d’Or competition in Lyon, France in January), told me about a freak storm that blew through the Allegheny mountains, where the resort resides, right before the annual Greenbrier Classic PGA tournament this summer. Multi-story grandstands were flattened, two-hundred year-old oak trees were uprooted, and the tri-state region was left without electricity for days – in some parts, weeks. The PGA authorized the resort to cancel the event. But The Greenbrier carried on. With the help of residents of the surrounding area – most of whom already work for the resort, but also many who pitched in for free – within forty-eight hours, the courses were cleared, the grandstands resurrected, and Rosendale and his team reorganized all of the food services, relocating to the famous underground Bunker, where there was a generator. The tournament was mounted (with a $6.1 million purse). Toby Keith, The Fray, and Bon Jovi all played. Thousands came and went. What sets The Greenbrier apart from other resorts and hotels of the same scale and scope in The United States (the themed palaces on Las Vegas’s Strip, for example) is its age. Visitors have been visiting The Greenbrier, formerly known as the “Old White, after the famous white sulphur springs on property, since 1778, just two years after the founding of the United States. And with age, comes history and tradition. The Greenbrier is called “America’s resort,” an appropriate name for a place that has seen such a tremendous amount of American history pass through its grounds. During the Civil War, the hotel was occupied by both the North and the South, used as a hospital. During the Second World War, it was leased by the U.S. government and used as holding grounds for foreign diplomats who were waiting to be exchanged for U.S. diplomats abroad. Due to its proximity to the nation’s capital, it has been, from very early on, favored by politicians. Woodrow Wilson played golf on the Old White TPC, one of three courses on the resort’s 6,000-plus acres, shortly after it was constructed. And, later, The Greenbrier was chosen as the site of a secret relocation bunker for members of Congress in case of nuclear threat. Tunneling hundreds of feet into the side of the Allegheny, beneath the main hotel, the bunker remained a secret for thirty years. It was finally made known to the public in 1992. At The Greenbrier, you will find vestiges of past grandeur rarely found in the United States. One of the most impressive examples that I witnessed was the hotel’s gold dinner service, a near-extinct display of opulence attributable only to the Gilded Age and the robber barons. I’ve only experienced gold service twice in my life before – once at Alain Ducasse’s three Michelin-starred Louis XV in Monte-Carlo, and once at Next’s debut Paris 1906 Escoffier dinner in Chicago (which wasn’t fully a gold service, since many of the dishes and utensils were not golden). You simply won’t find gold service offered anywhere that hasn’t offered it for decades already (the Next Escoffier series was an exception). Even if one could afford to buy china rimmed in 24-karat gold, and flatware to match, few, today, would. It’s expensive and impractical. Everything has to be polished and washed by hand. And though plated in gold, broken dishes are practically worthless (the trouble of separating the gold from the porcelain is probably not worth its value). 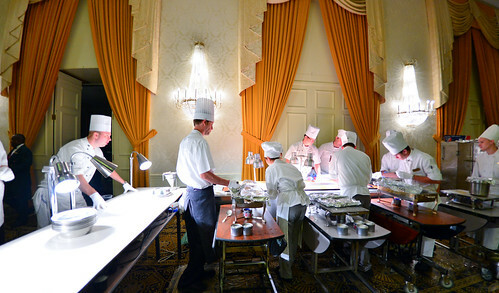 To welcome the Bocuse d’Or USA Foundation’s board members – Thomas Keller, Daniel Boulud, and Jerome Bocuse – and coaches (only Gabriel Kreuther attended this time) to the resort, The Greenbrier hosted a gold service dinner in the hotel’s Crystal Room. The party was not large, but it was pretty. In preparation, all sixty place settings for all six courses were spread out on tables in an adjacent ballroom, where a temporary service station was set up, complete with a conveyer belt to streamline the plating process. Crates of gold flatware were uncased and the utensils polished. Canapés were assembled onsite, arranged on trays, and sent out for rounds. They included spoonfuls of lobster gnocchi, and mini croque madames, topped with sunny-side quail eggs. During dinner, food arrived in batches from the kitchen and was held warm in chaffing trays for plating. Servers, suited and white-gloved, were dispatched in teams. The food? Classic French cuisine: lobster-stuffed turbot with sauce Americaine; beef tenderloin poached in beurre rouge, served with sauce Perigourdine; and a salad, at the end, of course, more cheese soufflé than greens. 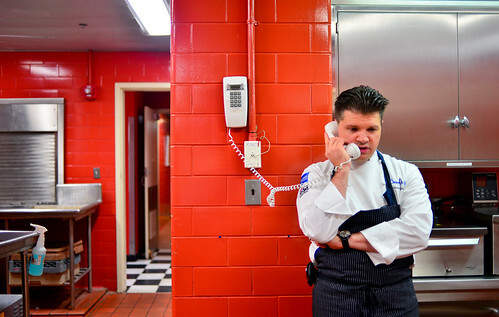 The majority of my time on this second trip to The Greenbrier was spent in The Bunker, where Richard Rosendale has replicated the cubicle kitchen in which he will have to cook at the Bocuse d’Or competition in Lyon next January. I can’t show you any pictures, or tell you about the food that he prepared for the Bocuse d’Or coaches and board members, who had gathered to evaluate Rosendale’s progress. But I can tell about what else we did. . In addition to the gold service dinner, the board members spent some time with the resort’s chefs and cooks, many of whom are in The Greenbrier’s rigorous culinary apprenticeship program (past graduates of the program include Rosendale and Michael Voltaggio). The board members talked about their experience as chefs, and then opened up the floor to questions. 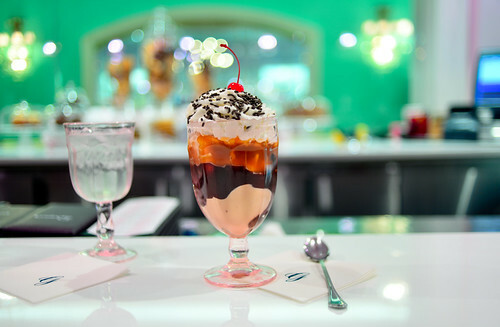 The Greenbrier is home to a collection of over a dozen restaurants. And I have eaten at almost all of them. Every morning, there was breakfast in the Main Dining Room (or, the MDR, as they call it), which, at peak capacity, can serve thousands of covers each day, between breakfast and dinner (the hot line in the kitchen runs nearly the length of a football field). I divided my time between the buffet, overflowing with options, and the menu, which offered everything from near-forgotten American standards, like chipped beef, to irresistible whims, like s’mores pancakes, topped with toasted marshmallows and served with a side of Valhrona dark chocolate sauce. Lakers’s Hall of Famer (and the man on the NBA logo), Jerry West, has his name on a steakhouse at The Greenbrier (Jerry West’s Prime 44, after his jersey number). We went there for dinner one night, where we had housemade charcuterie and Caesar salad, tossed table-side, garlicky and wonderful. Drew Garms, the chef, also sent out towers of seafood, delicious dry-aged steaks, and bowlfuls of warm, sticky toffee pudding à la mode. And to cap off our fun night out, Jerry West swung by to say hello. Jim Justice, the current owner of The Greenbrier, moved a lot of earth to build an underground casino at The Greenbrier. Inside the casino is In-Fusions, the hotel’s Asianesque restaurant. I ate there in July, and returned this time with Corey Siegel, Rosendale’s commis for the Bocuse d’Or, for dinner again. Chefs William Hicks and Nick Jones cooked for us, sending out a sampling that ranged from sushi to pad Thai. At Tree Tops, the outdoor café on the banks of the resort’s beautiful outdoor swimming pool, I had quiet lunch alone: a salad topped with The Greenbrier’s famous peaches, and a Cuban sandwich. I watched the mist overtake the mountains in the distance, opening up into a downpour. It was lovely. On my last night at The Greenbrier, I returned to the MDR (which turns 100 years-old this year) with Siegel for dinner (jackets and tie required). Steve Halliday, the dinner service chef, cooked for us an 8-course dinner off the cuff, marrying dishes from the à la carte menu with courses from the tasting menu. We ended with a selection of cheeses, and puffy Grand Marnier soufflés. In between, there were many, many sweets. I had mango tartlets and strawberries chantilly at the sumptuously dressed Café Carlton. At midnight, I snacked on a collection of cookies, delivered with a recipe. There was a chocolate brownie sundae with hot caramel at Sam Snead’s at the golf club, overlooking the 18th hole on the Old White TPC. And I spent way too many calories at Draper’s. What has become, perhaps, my favorite corner at The Greenbrier, it’s like an old ice cream parlor, with the addition of barbecue pork wonton nachos, and fried green tomato sandwiches slathered with black pepper aioli. I raided their ice cream case numerous times for sundaes and banana splits. I even created a dessert I call the “mountain of love,” based on something I used to make for myself in college for breakfast: a warm, Belgian waffle topped with ice cream (here, one scoop each of pistachio, coffee, strawberry, chocolate, and peanut butter); strawberries; a banana split; nuts; hot fudge, and whipped cream. Oh, and a cherry on top, of course. It’s the best thing ever. It was hard, after a week of being pampered at The Greenbrier, to leave. I have fallen in love with the place. 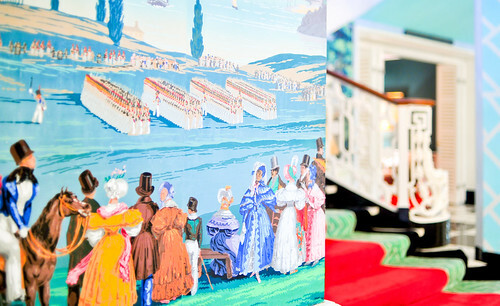 Where else will you experience a magical meeting of colors that, under the direction of anyone other than the estimable Dorothy Draper (former interior designer of The Greenbrier) or Carleton Varney (the current interior designer), would be a nightmare? Where else would they deliver a beautiful chocolate sculpture to your room, an afternoon snack before a gold service dinner? Or, a cupcake the size of your head? That’s the other thing I have come to know about The Greenbrier – they don’t do small here. Both of those were the handiwork of the resort’s executive pastry chef, Jean-François Suteau, who happened to be America’s competitor in the Coupe du Monde pastry competition in 2011. 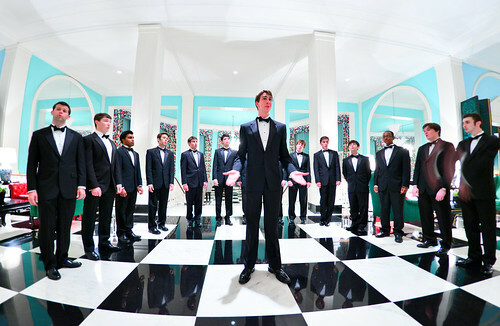 And where else do you find the Nassoons, Princeton University’s male a capella group, on your way back from dinner, serenading guests in the lobby? Only at The Greenbrier. Because there, anything is possible. * This was a work trip photographing for the Bocuse d’Or USA Foundation. So, this trip was paid for by the Bocuse d’Or USA Foundation. Photos: Richard Rosendale and Corey Siegel presenting their meat platter to Thomas Keller, Jerome Bocuse, Daniel Boulud, Gabriel Kreuther, Monica Bhambhani, Joel Buchman, and Peter Timmins, The Greenbrier, White Sulphur Springs, West Virginia; war on the walls of The Greenbrier; 24-karat gold-plated serviceware at The Greenbrier; gold service dinner at The Greenbrier; Richard Rosendale in The Bunker at The Greenbrier; Thomas Keller at The Greenbrier; Daniel Boulud at The Greenbrier; coffee ice cream sundae at Draper’s at The Greenbrier; and The Princeton Nassoons in the lobby of The Greenbrier. ~ by ulterior epicure on September 20, 2012. 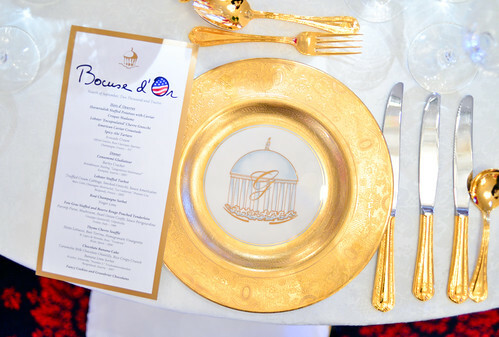 A simple and easy to read, hotel’s gold dinner service was the one I like and the images that describe the every post. The images in the flicker page are very interesting specially the “Willboro Bay” pic the clouds and the water. Ausable Chasm is the beauty and other images related to food were the awesome in flicker.